This weekend, the syndicated TV series At The Movies -- which has been around since 1975 -- finally ends its impressive broadcast run. Movie critic hosts have come and gone, and the series has endured the best of times (Ebert and Siskel) and the worst of times (Ben Lyons). But it's amazing to step back and think about everything that has happened in the culture since the series began in the disco decade. At the Movies has been around since The Ford Administration (!) and has remained on the air through the advent of VCRs, cable television, the Internet, streaming video, Netflix and more. That's pretty impressive. In fact, I think a DVD release of the Siskel and Ebert years would be a fantastic gift to film buffs, but I don't know if that's possible. Of course, the national discussion about film will continue, even if At the Movies does not. Still, a little light goes out of the pop-culture-sphere this weekend when that old balcony is closed permanently. In the New York area, At The Movies was broadcast on WPIX, channel 11, and usually aired around 7:00 pm on Saturdays...right before I often headed out with friends to catch a new release. And the recommendations of these TV critics always carried considerable weight in my film selection process. Siskel and Ebert had already hosted the PBS predecessor, Sneak Previews, prior to this Tribune-sponsored variation on the format. And in 1986, the duo moved on again, this time to Disney. Two inferior critics, Rex Reed and Bill Harris, manned their stations on At The Movies and the show drifted into silliness and pop-culture irrelevancy before merciful cancellation. Then, in the course of a fast-talking, high-spirited, ceaselessly-amusing half-hour, the two critics reviewed four new releases, assessing them, finally, with a "thumbs up" or "thumbs down." The series occasionally featured a fun segment with "Aroma the Skunk," the show's mascot (a critter who always sat next to Ebert, for some reason...). This led into a spirited discussion of "The Stinker of the Week." Sometimes, the critics even turned their gaze to new "home video" releases, and I recall one installment of At The Movies in which the duo discussed the 20th anniversary release of "The Cage," the original Star Trek pilot starring Jeffrey Hunter. Other movie critics -- not to mention several textbooks on film criticism -- have been notably rough on Siskel and Ebert over the years. An Introduction to Film Criticism (Longman Inc., 1989) dismissed the duo as a "Laurel and Hardy imitation" and noted that their reviews were "as shallow as the average review in a daily newspaper; simply the unsupported opinions of the reviewers," (pages 17-18). With respect to the authors of this book -- an otherwise outstanding study of critical approaches to narrative film -- I disagree. While it is true that Siskel and Ebert on At The Movies reduced film criticism to a simple (but useful) binary decision of thumbs up/thumbs down, it's also critical to make note of the medium in which they toiled. In fact, their program devoted more time to discussing film as an art form than any other weekly program in television history. Of course, the drawback of the TV format is time, and that should also be acknowledged in film books too. In the freewheeling blog format here, for instance, I can write about a movie until I'm blue in the face, but that's simply not the case in television. In a half-hour span, how many films can be debated in depth, especially once you throw in commercials, plus several clips of each film described? To ameliorate this concern, Gene Siskel and Roger Ebert talked fast, working in as much detail and analysis as was humanly possible. And they often devoted entire half-hours to a single relevant subject, so they could go into deeper detail. I remember an episode on the Star Wars trilogy (following the premiere of Return of the Jedi), another on the films of Woody Allen, and a third about the durability of the James Bond franchise. I remember that the critics also devoted one episode to sequels ("The Stinkers of 1983") and another one to reporting on screen violence. Again, there was simply nowhere else on TV you could go to find this in-depth perspective on modern film. I would also argue that Siskel and Ebert, on At the Movies, traveled well beyond the basics, and well beyond simple "unsupported opinions." In their review of Gremlins (1984), they got down to the satirical aspects of Joe Dante's initiative, and even the palette of the film, which lampooned Norman Rockwell's vision of America. In their review of Twilight Zone: The Movie (1983) they noted -- before just about anyone else did, I think -- Spielberg's drift towards on-the-nose sentimentality. Their review of Ghostbusters (1984) brought up relevant comparisons between Bill Murray and Groucho Marx. And in that review of "The Cage" that I mentioned above, they were able to contextualize the episode's narrative (about the dangerous, numbing nature of illusion as "narcotic") to the mid-1960s drug culture. I was in the sixth grade when I first started watching At the Movies, and I had never, ever, seen anybody, anywhere discuss films with this degree of specificity; in these contextual and historical terms. Within the obvious constraints of TV programming, Siskel and Ebert thus managed to provide a kind of weekly history lesson in cinema. They brought up films I had never heard of, and films I would never have sought out without their guidance. I watched a few old clips of the series again on You Tube this week -- after not seeing At the Movies in years -- and once more, I found myself sucked in by the passion and charm of these guys. Even today, their motormouth reviews are packed with interesting insights. When I began watching At The Movies, I preferred Gene Siskel to Roger Ebert. He was so acerbic, and had this funny manner of rearing his head back -- almost like a lion -- and then leaning forward when he was about to score a point. He seemed a bit more camera-savvy than his sparring partner, and could really land the zingers. But then I began reading Roger Ebert's movie yearbooks in 1987 (and purchased every new edition of the book through 1996...) and found that my tastes more closely aligned with his. Roger Ebert also seemed much more fair-minded, I soon realized. He often recognized and acknowledged the artistry of a film, even he didn't necessarily approve of the subject matter on personal terms (he championed Wes Craven's Last House on the Left, for instance.) I also began to grow more frustrated with Siskel over the years because I felt that his personal biases sometimes prevented him from recognizing a good film. He gave a "thumbs down" to James Cameron's Aliens (1986) because the film put a child, Newt, in harms way. I never felt that was a valid criticism, even as a kid. As I like to say, how would Gene Siskel have judged the movie had the aliens -- vicious, slobbering beasts -- treated the child with kid gloves? Of course, that would have been silly and unrealistic, and a good critic like Siskel would have noted that terrible lapse in tone and realism. Yet the critic had put Aliens in a box from which the film could not escape; from which it could not achieve a good review. No doubt I've done the same during my writing career, but I do try hard to remember this example. Ultimately, I came away from At the Movies preferring Ebert. I always liked how -- when the camera turned to him -- he would absently straighten out his cardigan and then almost imperceptibly glide forward in his chair, towards the audience...like a wise philosopher sharing wisdom with his best student in the spirit of knowledge, not arrogance or superiority. To this day, I make Ebert's blog a regular stop. He's the only film critic ever to win a Pulitzer Prize for criticism, and just recently he was judged America's most trusted pundit. Still, it's a crying shame there's no "Collected Criticism of Gene Siskel" available in print ten years after the man's death. Ultimately, it was the discovery of Ebert on the book store shelves that drew to me to his manner of thinking; to his reasonable tone, fair-mindedness and consistent standards. But Siskel remains an important enough figure in the annals of film criticism that someone ought to assemble a collection of his reviews in print, and contextualize his work. 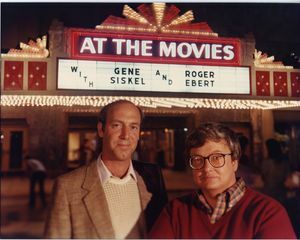 As I noted above, At the Movies went on sans Siskel and Ebert, but without these guys at the helm it was almost a self-parody, just two critics bitching over movies they didn't like, with no clear understanding of the standards applied. I watched the new crew a few times and found the enterprise...embarrassing. I attended the University of Richmond in 1988, and watching television wasn't really an option or concern for me at that point, so I didn't keep up with the new Siskel and Ebert series very closely. Then I got married, and moved into my own writing career, and only occasionally saw Siskel and Ebert's show again in the later 1990s. However, I was very upset to learn that Gene Siskel had passed away in 1999, and tuned back in a few times to watch the new sparring partner, Richard Roeper. I had no problems with Roeper as a film critic or on-screen personality, but felt that the magic was gone; that nobody really challenged Ebert the way Siskel did. Siskel made Ebert better; and Ebert made Siskel better. Perhaps it was the spirit of competition, perhaps it was friendship, perhaps it was just chemistry...but their partnership worked. It worked so well, in fact, that filmmakers have gone out of their way to acknowledge (or attack) the duo. The 1987 film Willow featured a two-headed dragon named Sissbert, for instance. And the dreadful Godzilla of 1998 featured a New York Mayor Ebert and his assistant, Gene. And who can forget, Carpenter's They Live (1988), which revealed Siskel and Ebert to be insidious alien invaders?! I remember the year the Gene Siskel passed away, and the Academy Awards failed to include him in their "In Memoriam" and Whoopi Goldberg, who was hosting, took the time to bring up his passing and give him a thumbs up. Very touching. I loved watching At The Movies, I'll miss it. Well remember AT THE MOVIES. I still have the STAR WARS episode you mention, their review of WRATH OF KHAN, and an incredibly silly sequence of them on Letterman's show (the old NBC version) shooting baskets to determine the year's best film. What a lovely tribute. I have fond memories of being a small lad and my folks letting me stay up to watch Siskel and Ebert during their PBS Sneak Previews era and I continued to follow them when they hit the big time and I think that watching their show over the years definitely contributed to cultivating the cineaste in me. "... I was very upset to learn that Gene Siskel had passed away in 1999, and tuned back in a few times to watch the new sparring partner, Richard Roeper. I had no problems with Roeper as a film critic or on-screen personality, but felt that the magic was gone; that nobody really challenged Ebert the way Siskel did. Siskel made Ebert better; and Ebert made Siskel better. Perhaps it was the spirit of competition, perhaps it was friendship, perhaps it was just chemistry...but their partnership worked." Yes, indeed. To me Roeper always seemed to be trying to make a name for himself, to be a bona fide, big time film critic. That always rubbed me wrong given that the chair he inherited belonged to someone who didn't fit that mold, nor tried to. 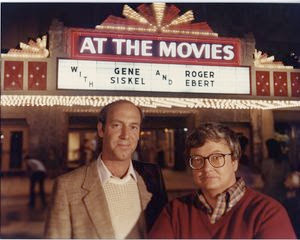 But when Siskel and Ebert were together, it was magic. Thanks very much for this, John. Trick-or-Treat Pete: I was always very fond of Gene Siskel. Didn't always agree with his conclusions, but that's okay. He had a razor-sharp wit and could argue his case so convincingly. I miss his voice in our culture today. Linda: I would love to see that Wrath of Khan review. I remember their review for Search for Spock, but i'm not sure I was yet watching as of Wrath. I bet it's a hoot. J.D. I'm glad you mentioned your own past here; I think that many of us (and I mean MANY) were really inspired by Siskel & Ebert to take our love of movies into our adult lives and into our professions and careers. It was amazing to watch two smart, well-spoken movie critics debate the merits of a film. It is still is. Le0pard13: I guess if I had begun At the Movies with Roeper, I might feel more affection for him. To me, he's just Siskel's replacement. Adequate, but not particularly memorable. thanks for the comments! Best to all! I'm old enough to remember Siskel and Ebert's "Sneak Previews" show from the late 1970s. Their conversations were always engaging and lively, and I liked the fact that you could tell they didn't really get along very well. (I think they grew to like each other more over time.) I was much more into Pauline Kael at the time and kind of looked down on them for the shallowness of their analysis, but thinking back they did pack in a lot of juicy discussion given the limitations of the format. I too was heavily influenced by Pauline Kael. I always loved her review of Invasion of the Body Snatchers, which she said was the best American film of 1978. At college, my film instructor sort of looked down at Siskel and Ebert because of their binary (thumbs up/thumbs down) approach to movies. But I was hooked on At the Movies anyway, and felt that Siskel and Ebert actually devoted more time to film than any other TV show/TV reviewers in history. I remember how irritating nightly news critics (like Dennis Cunningham on CBS) were, and how they seemed to dislike or like movies on a whim. Siskel and Ebert kept each other honest. No whims allowed, or they'd face the wrath of their partner. They had to present cogent arguments for their choices...and I appreciated that. I still find their At The Movies back-and-forths informative and fun, and still occasionally miss them, though these days I prefer written, long-form movie journalism too. Never was a huge fan of Siskel or Ebert but I simply loved, loved, loved the fact that they fought so hard for Hoop Dreams, one of the greatest docs of our time. On the Criterion DVD of Hoop Dreams they have the complete At the Movies segments whenever Hoop Dreams was mentioned (they named it best film of 1994 and Ebert named it best film of the 1990s). I believe, according to myriad sources, that At the Movies relentless criticism of the Academy Awards treatment of Hoop Dreams (the film was nominated for editing but not best documentary due to an archaic judging process) led to changes in how they 'judged' best documentary features. Like them or not, in big ways or small, they influenced the industry.